Banners, buntings, pennants... whatever YOU call them, they are all the rage in digi right now. I cannot resist adding one to a page when a designer includes them in a kit. Now, you can make your own with ease! 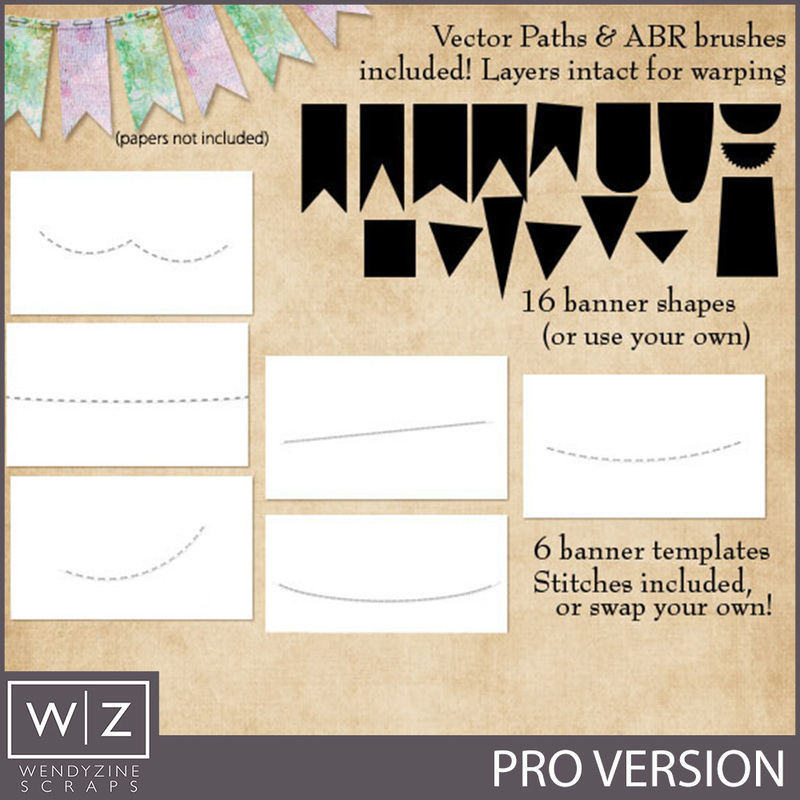 This set comes with 16 different banner shapes and 6 different path templates. 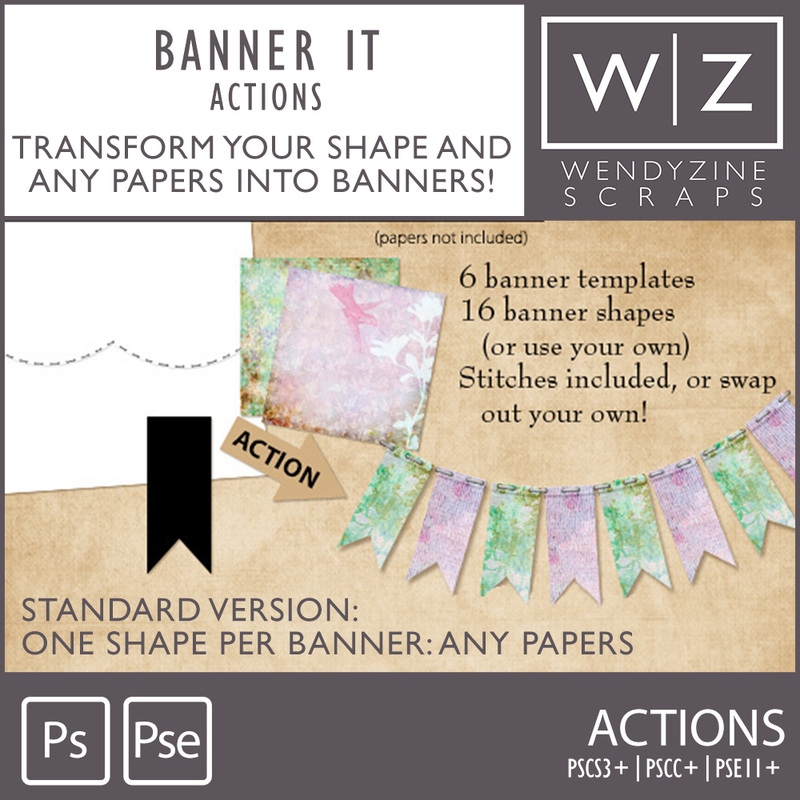 Combine those with the actions and you get a custom banner ready to coordinate with your layout! How does it work? Open a path template. Run the corresponding action. When prompted, choose your banner shape. Then, select your papers as it runs. When you are done, tweak the placement. But wait... there's more! (LOL) Each path template comes with a simple stitch that you can recolor. Or, use the path to make your own strings or stitching with your favorite actions and styles. In addition, you can use any banner shape you might want to use. Just size it to the approximate size of one of the existing banners and save it as a PNG. Finally, you get an emboss layer for adding a little dimension to the banners. There's an action included for clipping that later to your banners after you're done. And, a Warp action for warping the shadows for a more realistic look. PSCS users can use any shadow style along with the warp action. PSE users have the shadow applied for them. There's also a PRO edition for designers that is more flexible and okay for creating banners to include in your kits. Tested in PSE6-10, PSCS2-5.5. Kit not included. Personal Use only. See the Pro edition for Designer-Use. WARNING: This action is addictive. Use of this action may result in procrastination of house chores or scrapping. Listening to scrapbooking podcasts highly recommended during the use of this action to assist in multi-tasking.